LinPlug CrX4: offers sampling in a synth. We'd almost forgotten about LinPlug's CronoX 4, which the company previewed in February, but we've just got word that it's been released. The name has been truncated slightly to CrX4, but this is very much the successor to CronoX 3. It's a synth that comes with its own sampling engine, which promises to lead to the creation of some unique sounds. Find out more in the press release below - you can buy LinPlug CrX4 from the LinPlug website for $149/€119. LinPlug hereby announces the release of the CrX4 Sample Synthesizer AU and VST plugin for Mac OS X and Windows PC. CrX4 is the successor to the CronoX 3 and uses any kind of samples as raw material for synthesis. 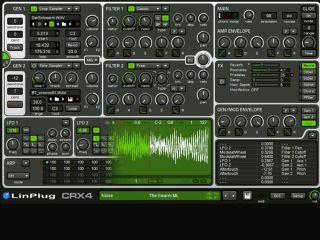 CrX4 includes a range of virtual analogue features such as a variety of oscillators, unison detuning, amplitude and frequency modulation, the unique free-type-filter, an arpeggiator, and a modulation matrix, wicked LFO's and a comprehensive effects section. The key feature of CrX4 that distinguishes it from other synths is its unique sampling engine and its free-type-filter which allows sounds no other instrument can produce. Using these features and the CrX4 realtime modulation options supports highly expressive performances and complex evolving sounds.